Our prod­uct range includes both com­plete solu­tions, that cov­er dif­fer­ent appli­ca­tion sce­nar­ios com­plete­ly and post-quan­tum secure, as well as indi­vid­ual com­po­nents such as encryp­tion, dig­i­tal sig­na­tures and secure com­mu­ni­ca­tion tech­nolo­gies. These com­po­nents can be plugged into the exist­ing sys­tem archi­tec­ture to meet the desired secu­ri­ty goals with­out major change of the sys­tems. Our tech­nolo­gies and prod­ucts are par­tic­u­lar­ly suit­ed for use in embed­ded sys­tems and con­strained IoT-devices ensur­ing the high­est lev­el of secu­ri­ty against all kinds of attacks includ­ing quan­tum com­put­er and side chan­nel attacks. We also offer blockchain solu­tions for IoT and sup­ply chain sce­nar­ios tar­get­ing the safe trans­port of goods. Cur­rent­ly applied secu­ri­ty mech­a­nisms are not suit­able for IoT devices, which are char­ac­ter­ized by con­strained resources and low com­pu­ta­tion capa­bil­i­ties. Deployed IoT-devices most often are required to pro­vide secure and fresh data in real time. How­ev­er, by a com­plex pub­lic key infra­struc­ture (PKI) as in use today this goal is often not achieved espe­cial­ly for bil­lions of IoT devices com­mu­ni­cat­ing over an inse­cure chan­nel. 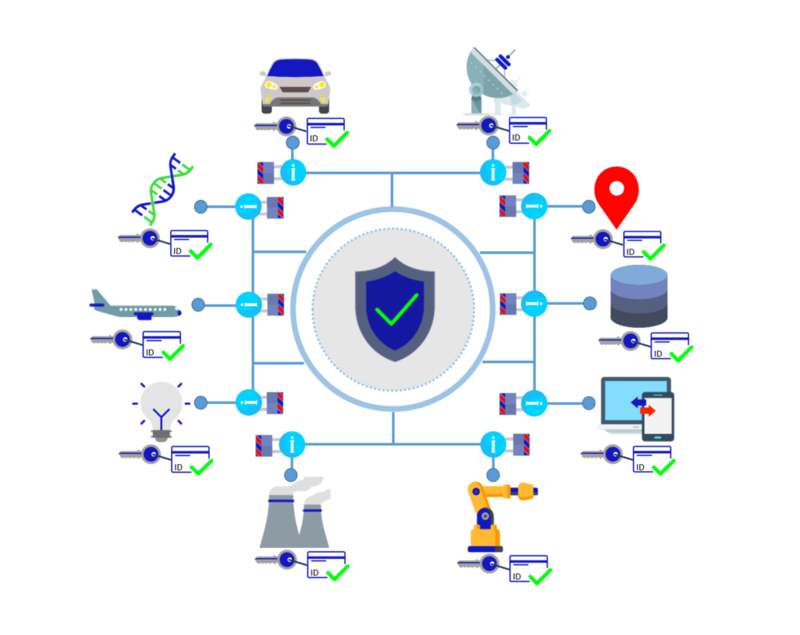 Quan­tum IDEn­crypt is the next gen­er­a­tion of encryp­tion and authen­ti­ca­tion tech­nol­o­gy for IoT and address­es all those draw­backs at once. Equipped with a secure iden­ti­ty man­age­ment sys­tem, the ben­e­fits of this tech­nol­o­gy are diverse. strings. The cus­tomer direct­ly ben­e­fits from com­plete­ly elim­i­nat­ing mech­a­nisms for cer­tifi­cate issuance, ver­i­fi­ca­tion and stor­age. As opposed to the PKI-based approach Quan­tum-IDEn­crypt is designed to eas­i­ly scale for bil­lions of IoT devices, where mem­o­ry and com­pu­ta­tion require­ments as well as the com­mu­ni­ca­tion over­head are to be min­i­mized. This saves costs and con­serves resources. It is par­tic­u­lar­ly suit­able for IoT and key exchange. With the inno­v­a­tive iden­ti­ty man­age­ment sys­tem, all iden­ti­ties and keys can be man­aged. In this way, orga­ni­za­tions and com­pa­nies can be mapped in a user-friend­ly man­ner while keep­ing track of the secu­ri­ty in the com­pa­ny at any time. It pro­tects your data against all kinds of attacks includ­ing quan­tum com­put­er attacks and no longer requires an expen­sive pub­lic key infra­struc­ture (PKI). By this tech­nol­o­gy pub­lic keys are derived just from short data strings. The cus­tomer direct­ly ben­e­fits from com­plete­ly elim­i­nat­ing mech­a­nisms for cer­tifi­cate issuance, ver­i­fi­ca­tion and stor­age. Quan­tum IDEn­crypt and the com­mu­ni­ca­tion chan­nels are pro­tect­ed against quan­tum com­put­ers. It can be used for secure key exchange, as required for TLS and VPN. Com­mu­ni­ca­tion chan­nels are pro­tect­ed and can­not be eaves­dropped. This tech­nol­o­gy is suit­able for use in IoT due to effi­cient oper­a­tions and the absence of pub­lic key retrieval or stor­age. There is no pub­lic key infra­struc­ture need­ed. Stor­age, issuance and ver­i­fi­ca­tion of cer­tifi­cates is also omit­ted. Quan­tum IDEn­crypt is use­ful for a wide vari­ety of appli­ca­tions such as secure e-mail, VPN, TLS and much more. Quan­tum-Mul­ti­sign is an inno­v­a­tive and quan­tum com­put­er resis­tant secu­ri­ty solu­tion used to secure­ly authen­ti­cate finan­cial trans­ac­tions, con­tracts, process­es and oth­er data. The eerie prob­lem of “CEO Fraud” or wrong trans­ac­tions, which costs com­pa­nies mil­lions of euros each year, is solved cost-effec­tive­ly and in a user-friend­ly way. Via flex­i­ble poli­cies var­i­ous par­tic­i­pants such as accoun­tants, CFOs or CEOs, in the trans­fer or approval of con­tracts or real-time trans­ac­tions (for exam­ple, via the smart­phone) are noti­fied and able to co-decide at any time. The secu­ri­ty solu­tion pro­tects against the neg­a­tive impacts from loss or theft of devices based on inno­v­a­tive and quan­tum-safe tech­nolo­gies. Quan­tum-Mul­ti­sign and the exchanged data are pro­tect­ed against quan­tum com­put­ers. The loss of a device has no imme­di­ate neg­a­tive impact. An attack­er can­not do any dam­age to a stolen device. Con­tracts, process­es, data or trans­ac­tions are com­mu­ni­cat­ed in real time to the oth­er mem­bers. Com­plex poli­cies can be cre­at­ed for any num­ber of mem­bers and devices. This tech­nol­o­gy can be used to authen­ti­cate process­es, con­tracts, trans­ac­tions, blockchain appli­ca­tions and oth­er data. A secure key exchange is par­tic­u­lar­ly use­ful when large amounts of data have to be sent over an inse­cure com­mu­ni­ca­tion chan­nel. A secure IPSec or TLS con­nec­tion allows you to secure the net­work or com­mu­ni­ca­tion chan­nel to pro­tect your inter­net, cloud, or ser­vice appli­ca­tions against unau­tho­rized third par­ties. Dig­i­tal sig­na­tures and data encryp­tion pro­tec­tion are among the most basic secu­ri­ty build­ing blocks in mod­ern appli­ca­tions to guar­an­tee the con­fi­den­tial­i­ty of infor­ma­tion being exchanged or stored, or to authen­ti­cate the ori­gin of data and ensure its integri­ty over the inter­net. Request a free brochure today! A secure IPSec or TLS con­nec­tion allows you to secure the net­work or com­mu­ni­ca­tion chan­nel to pro­tect your inter­net, cloud, or ser­vice appli­ca­tions against unau­tho­rized third par­ties. Dig­i­tal sig­na­tures and data encryp­tion pro­tec­tion are among the most basic secu­ri­ty build­ing blocks in mod­ern appli­ca­tions to guar­an­tee the con­fi­den­tial­i­ty of infor­ma­tion being exchanged or stored, or to authen­ti­cate the ori­gin of data and ensure its integri­ty over the inter­net.